Newsflash: Not every woman who diets does it to improve her overall health. Questionable trend-based dieting is everywhere thanks in part to the Kardashians and social media wellness influencers, but what are the real reasons women are constantly looking to lose weight? And are the reasons why women want to drop some pounds actually leading to changes that result in overall healthier living? A survey asked 1,000 women who diet often about their inspirations for a new way of eating, and while nearly 62 percent cited a concern for overall health, 47 percent of those asked just wanted the number on the scale to go down. The most popular diets among those asked were the Ketogenic Diet and Gluten-Free lifestyle, one in five admitted to switching to one of those as a new way of eating. Of those who dieted for one month, 21 percent fell into a healthy BMI, but that rate jumped significantly among those who changed their eating habits long term instead of following a crash diet. For those women who switched to a gluten-free diet, the top reasons were to feel healthier overall, to lose weight, and because their partner asked them to. Topping the list for reasons behind the choice of those who switched to a Ketogenic diet were losing weight, their partner wanted it, and “it seemed like a good idea." Those who switched to eating organic food only wanted to feel healthier overall and cared about the environment. Ethical reasons also topped the list, as did again, a partner wanting them to improve their diet. Paleo diet followers were usually wanting better overall health or their partners requested they try it. The type of diets that didn’t list a significant other wanting to see the partner lose weight were vegan, vegetarian, and pescatarian. 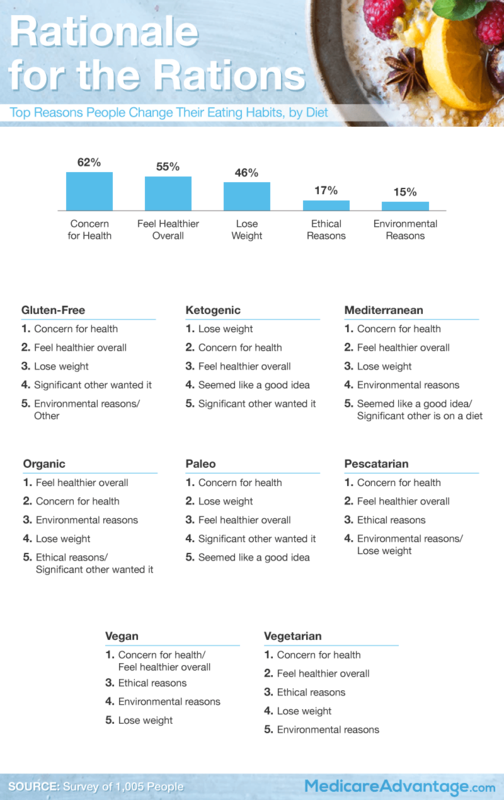 Ethical, environmental, and overall health topped the reasons why people followed those.